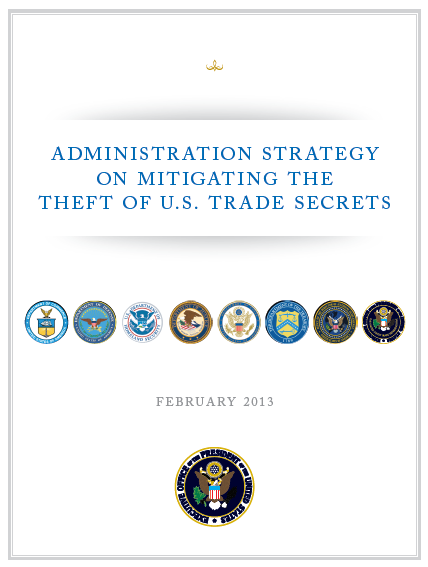 The following strategy on mitigating the theft of trade secrets and other intellectual property was released by the White House on February 20, 2013. The Administration is focused on protecting the innovation that drives the American economy and supports jobs in the United States. As a Nation, we create products and services that improve the world’s ability to communicate, to learn, to understand diverse cultures and beliefs, to be mobile, to live better and longer lives, to produce and consume energy efficiently and to secure food, nourishment and safety. Most of the value of this work is intangible—it lies in America’s entrepreneurial spirit, our creativity, ingenuity and insistence on progress and in creating a better life for our communities and for communities around the world. These intangible assets are often captured as intellectual property—copyrights, patents, trademarks and trade secrets, and reflect America’s advantage in the global economy. Emerging trends indicate that the pace of economic espionage and trade secret theft against U.S. corporations is accelerating. There appears to be multiple vectors of attack for persons and governments seeking to steal trade secrets. Foreign competitors of U.S. corporations, some with ties to foreign governments, have increased their efforts to steal trade secret information through the recruitment of current or former employees. Additionally, there are indications that U.S. companies, law firms, academia, and financial institutions are experiencing cyber intrusion activity against electronic repositories containing trade secret information. Trade secret theft threatens American businesses, undermines national security, and places the security of the U.S. economy in jeopardy. These acts also diminish U.S. export prospects around the globe and put American jobs at risk. As an Administration, we are committed to continuing to be vigilant in addressing threats—including corporate and state sponsored trade secret misappropriation—that jeopardize our status as the world’s leader for innovation and creativity. We will continue to act vigorously to combat the theft of U.S. trade secrets that could be used by foreign companies or foreign governments to gain an unfair economic edge. Departments across the U.S. government have roles in protecting trade secrets and preserving our nation’s economic and national security. This strategy recognizes the crucial role of trade secrets in the U.S. economy and sets out a means for improved coordination within the U.S. government to protect them. The Department of Justice has made the investigation and prosecution of corporate and state sponsored trade secret theft a top priority. The Department of Justice and the FBI will continue to prioritize these investigations and prosecutions and focus law enforcement efforts on combating trade secret theft. The FBI is also expanding its efforts to fight computer intrusions that involve the theft of trade secrets by individual, corporate, and nation-state cyber hackers. The Department of Homeland Security component law enforcement agencies will continue to work cooperatively with the Department of Justice when its investigations uncover evidence of trade secret theft. •• The dissemination, use, and associated impact of information lost in trade secret misappropriation. ODNI, though the Office of the National Counterintelligence Executive (ONCIX) will also counter the threat of trade secret misappropriation by sharing threat warning and awareness information with the private sector, as well as imparting counterintelligence tradecraft procedures tailored to the private sector. In order to support this strategy, ONCIX will brief trade association groups and conferences on industry specific threats. The Department of Justice and the FBI will continue to report on trade secret investigations and prosecutions. Additionally, the FBI will continue its outreach and education efforts with the private sector through various local, regional and national initiatives. At the local level, each of the FBI’s 56 field offices will continue to work with academic institutions, manufacturers, laboratories and other entities that are located within the field office’s area of responsibility and are perceived as being potentially at risk for trade secret theft. At the regional level, the FBI will continue to meet regularly with other government agencies, industry, and academia to share information about insider threats, economic espionage and trade secret theft. The FBI’s headquarters will review the effectiveness of its local and regional efforts with a focus on the extent of outreach to companies and entities such as cleared defense contractors, universities, hospitals, high science companies, and emerging technology firms. The FBI will continue to engage with trade secrets owners through several national outreach organizations, including the Domestic Security Alliance Council, the National Security Business Alliance Council, and InfraGard, and will continue to work closely with various Information Sharing and Analysis Centers. These local, regional and national efforts will continue to reach a broad swath of companies in multiple sectors such as information technology, communications, aeronautics, engineering, energy, financial services, and consumer retail. The FBI’s engagement with the private sector promotes reasonable safeguards based on recent intelligence, case studies, and emerging trends. The Department of Justice and the FBI will continue to train prosecutors and investigators on trade secret theft with the goal of increasing the number of successful investigations and prosecutions for violations of the Economic Espionage Act. These training events will target domestic law enforcement officers, prosecutors, and international partners. These events will include both a trade secret specific curriculum as well as broader intellectual property rights enforcement themes in which trade secret theft is a component. The National Intellectual Property Rights Coordination Center will obtain leads regarding trade secret misappropriation through its “Report IP Theft” Initiative. The Department of Defense, through the Defense Security Service, will collect, analyze and report on threat information to cleared industries that support Department of Defense programs and the missions of other U.S. government departments and agencies. The Defense Security Service, in coordination with its partner agencies, will continue to provide advice to those cleared industry partners and deliver security training and education on counterintelligence. Through its annual report on trend analysis of threats targeting to U.S. defense technologies, the Defense Security Service will continue to communicate its analysis to industrial partners of the U.S. government. The Defense Intelligence Agency will co-chair the National Critical Systems and Joint Technology Task Force with the FBI. 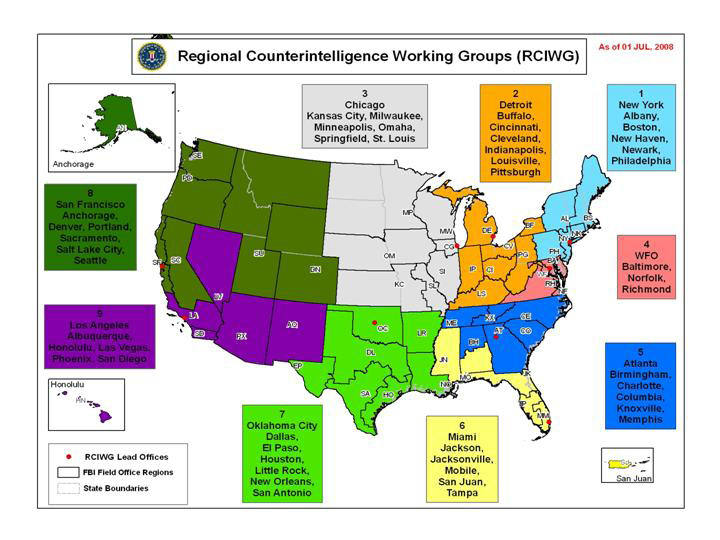 This effort will continue to provide a collaborative forum to provide input into the counterintelligence efforts to protect critical and emerging technologies by Federal agencies.